Gene Laughter, an ex-lifeguard from the Fifties—nicknamed “Swink,” was a mischievous and creative man. He used to entertain his family on summer vacations by writing notes and putting them into bottles, then casting these into the ocean. This practice became elaborate and got out of hand in 1978. A note on an aged parchment found in an antique bottle wound up at the offices of the Charlotte Observer newspaper. The note was supposed to have been written by marooned sailors on a whaling vessel that had sunk in 1887. The Charlotte Mint Museum authenticated the find and the story went out over the wire services, gathering a bit of national coverage. The Whaling Museum of New Bedford, Massachusetts promptly reported that the discovery must be a hoax, for the supposed ship, the Ann Alexander, had gone down to Davey Jones’ locker thirty years before the date of the note. No money had changed hands on account of the hoax, so the prankster did not go to jail. However, Swink Laughter’s name became familiar to Charlotte newspaper columnists, Kays Gary and Jerry Bledsoe. When Laugher decided to hold a reunion of old beach bums in 1980, he convinced Bledsoe to feature the story. Several articles appeared on the history of the Shag and Laughter’s effort to to get the beach bums back together. Laughter himself spent a great deal of time and energy tracking down old acquaintances. About a month before the party was set to kick off, a second antique bottle containing a note was found on the Carolina shore. Once again, Laughter had struck. This time the Sumter South Carolina Daily Item was duped. After the story ran locally, it was picked up by the Associated Press. For several days, maritime archivist all over the country scrambled, either to verify authenticity or expose a fraud. In reality, the note was a coded, open invitation to Swink Laughter’s reunion. Anyone familiar with the upcoming festivities, or with rhythm and blues music, would have seen straight through the double entrendes. Captains Earl Bostic and James Rick were rhythm-and-blues group leaders. Bostic’s ship, “Flamingo,” was the title of a hit record. “Raven” referred to Jimmy Ricks and the Ravens. 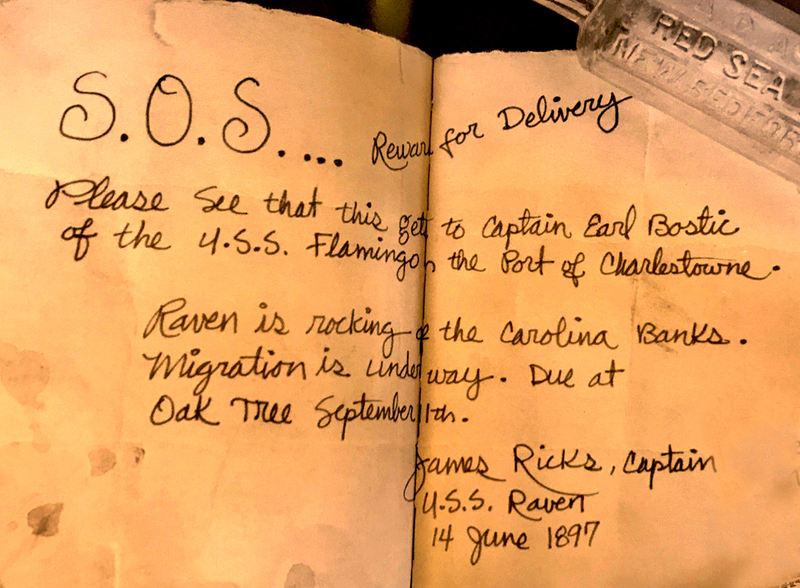 Oak Tree was the name of the revelers and September 11 was the kick off date of the beach party. Laughter owned up to the hoax at a national press conference in Richmond on August 26. He had managed to garner a bit of national advertising for the price of an antique bottle and a scrap of old paper. The beach bums’ reunion was off to a clever start. Laughter expected perhaps five hundred people to show up on Ocean Drive. Something like two thousand souls migrated.